Speaking at the Munich security conference on Saturday, the German chancellor said she wanted to secure peace in Europe with Russia and not against it. Merkel admitted, however, that she was not certain the talks she and the French president, François Hollande held on Friday in Moscow with the Russian president, Vladimir Putin, would result in a peaceful solution to the crisis. “But it is in my view and the French president’s view definitely worth trying. We owe it to the people affected in Ukraine, at the very least,” she said. The Ukrainian president, Petro Poroshenko, said a peace proposal aimed at ending clashes with pro-Russian separatists in eastern Ukraine could work. Germany has opposed aiding Ukrainian troops for fear of worsening the conflict, which has already cost more than 5,000 lives, but the idea has many supporters in Washington. Nato’s top military commander said on Saturday that the west should leave the option of military invervention on the table. US Air Force General Philip Breedlove said he favoured aiding Ukrainian forces with weapons and equipment rather than sending in troops. Breedlove also said that Putin’s proposals to end the conflict were “completely unacceptable”. Merkel is expected to meet the US secretary of state, John Kerry, and his Russian counterpart, Sergei Lavrov, on Saturday, along with Poroshenko and the US vice-president, Joe Biden. The focus at the Munich conference is on a new blueprint agreed in overnight talks in Moscow between Putin, Merkel and Hollande. The aim is to reach a solution to the crisis before it turns into a major east-west confrontation. No details were released about the Moscow talks, but the new plan is likely to be based on the failed September Minsk ceasefire and peace accords that the west accuses Moscow of failing to adhere to. “Work is under way to prepare the text of a possible joint document to implement the Minsk agreements,” said Putin’s spokesman, Dmitry Peskov, who described the Moscow talks as “substantial and constructive”. Putin, Merkel and Hollande, who all left Moscow late last night, made no public comment after the meeting and are to discuss the plan again with Poroshenko by telephone on Sunday. German media broadly welcomed the latest initiative on Saturday, saying time was running out to avoid a disaster for Europe. Spiegel Online said that with Merkel expected to meet Barack Obama on Monday, “this weekend will be crucial for how the crisis in eastern Ukraine and relations with Russiadevelop”. 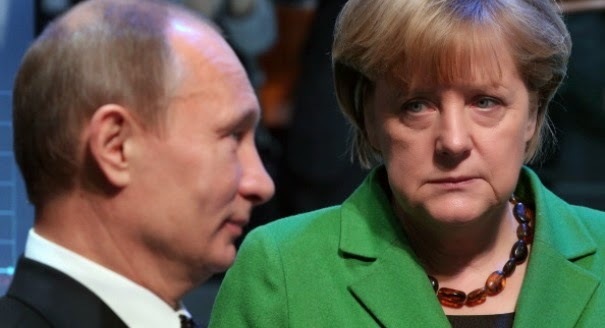 “If Merkel fails in Moscow, the US will want to punish Putin,” it said. In one positive sign, rebel and Ukrainian forces agreed a ceasefire for several hours on Friday around the battleground town of Debaltseve to allow civilians to leave.